This performance takes place in the downstairs room of the venue, but the set-up is similar, with a small stage at the front of the room and an audience capacity of around 30. The sole performer of the play, Zoe Hutmacher, is in character from the moment the audience enters the space, poised on a chaise longue, reading a magazine and sipping a large glass of wine, occasionally tapping along to the music that plays out across the room. The year is 1961, and we join Esthie in Hollywood, a backdrop to which she constantly alludes, highlighting her extravagant lifestyle and namedropping stars along the way. Esthie’s performance is a conversation, but we are only presented with one side. Esthie’s dialogue begins by directly addressing someone, and although we wonder if we as the audience are to take on this persona, it soon becomes clear that we are purely spectators to this conversation, and Esthie is in fact talking to an individual from the film industry. An individual who wants to make a film about Auschwitz’s Block 24 Brothel. As we come to learn over the course of the play, Esthie is a German political Holocaust survivor, and is being approached by those involved with this film due to her own experiences of Block 24 Brothel. Zoe Hutmacher’s Esthie has a flirtatious nature, one which evidently works to her advantage in her Hollywood lifestyle, but as she begins to flit between her outrage at the nature of the script and her pain and terror in remembering what she witnessed all those years ago, Hutmacher’s impressive versatility leads us through many heart-wrenching moments of the brutal truth. Rachel Neuburger’s script is consistently engaging, switching successfully between Esthie’s comic and flippant remarks about her current life, and moments of real anguish when reflecting on the past. Hutmacher upholds the hour’s worth of dialogue with effortless fluidity and delivers every phrase as naturally and credibly as if she draws the words and thoughts from her own mind. Nepenthe is a distinctive and dynamic portrayal of a side of war that isn’t often portrayed, as well as an important exploration of the issues within Hollywood’s presentation of the horrors of Auschwitz. 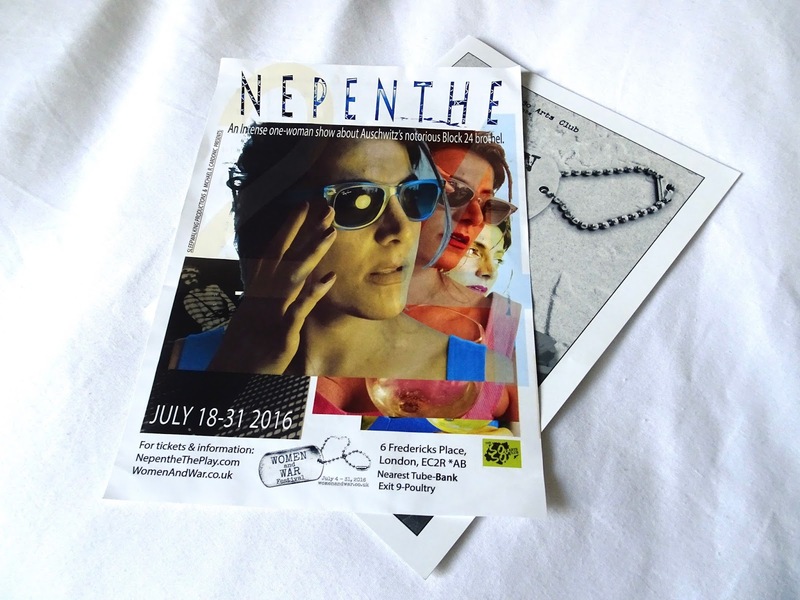 You can catch Nepenthe on 29th, 30th and 31st July, along with a number of other war-related shows that are on until the end of this week. Huge thanks to Theatre Bloggers for making this review possible. *I was gifted my ticket in exchange for a review, but all words and opinions are my own.